I am delighted have my friend Donna Druchunas as guest on Sites and Stories! Donna is an expert knitter, dedicated to documenting and sharing traditional patterns from around the world. Many of her own original designs are inspired by artifact and heirloom pieces. I’ve been a huge fan of her work for a long time. Welcome, Donna! My name is Donna Druchunas and I am a writer, knitwear designer, and travel junkie. My passions for knitting, history, culture, and story-telling are at the center of my work. I’ve been a fan of Kathleen since I first met her at a Women Writing the West conference years ago. One of my favorite things about Kathleen’s books is the way she always manages to bring something beautiful and handmade into the story, even if it’s a murder mystery! In Tradition of Deceit, the fifth Chloe Ellefson mystery, the folk art that touches the story is the paper-cutting tradition from Poland, called Wycinanki. My own research about Lithuanian folk art and knitting motifs led me to discover a similar paper-cutting tradition that has been popular in Lithuania since the sixteenth century and is still being practiced today. Simple pieces of paper are cut into intricate and delicate shapes that look like lace. In Lithuania, beautiful examples of this art form are exhibited in museums and available for sale in shops, such as these pieces that I saw at a folk art shop in Vilnius, the capital of Lithuania. What I find so fascinating is the endless possibilities for using ancient and traditional folk art motifs in different forms of arts and crafts. 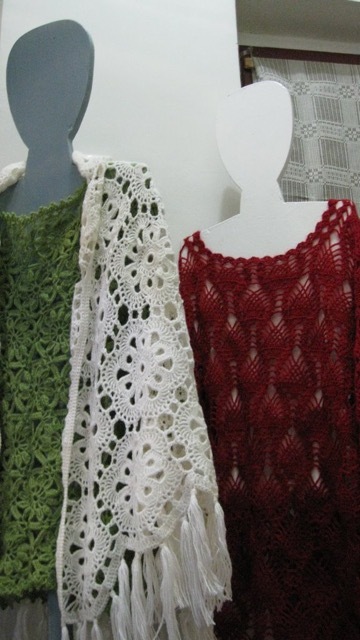 The feeling of the lacy white paper art is reflected in this beautiful crochet shawl in the same shop. Another example of how malleable folk art can be is the common 8-pointed geometric motif. I love how this same simple shape can be the sun, a star, a flower, or a snowflake depending on where and when it is used. 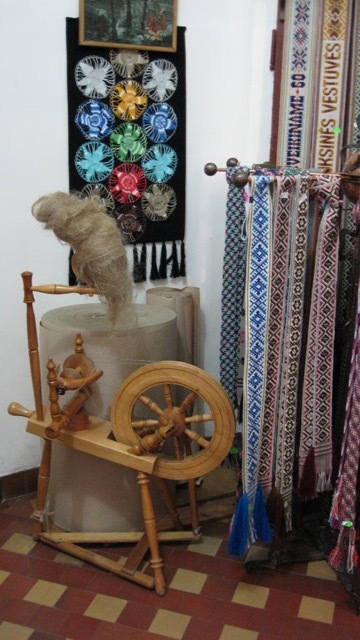 It is used in knitting, embroidery, weaving, wood carving, and in many other crafts. Many of the oldest folk art symbols were used around the world, while some newer motifs and more stylized versions of older symbols have come to be associated with specific places. For example, the 8-pointed snowflake, which is seen as a flower in Lithuania, is most commonly identified with Norwegian knitting today. and in multiple colors on the cuff of a sock. I love how adaptable this simple geometric motif is. Before knitting came to Lithuania in the 18th century, this motif had been used in weaving, wood carving, metal work, and to decorate ceramic and clay pots as far back as the Stone Age. 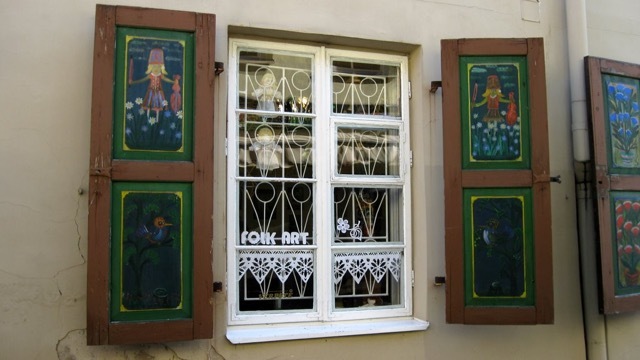 Because Lithuania and Poland are neighbors and were actually joined as one nation for about 300 years–from 1385 until 1795–it’s not surprising to find some similarities between the folk art and aesthetic sensibilities of both countries. 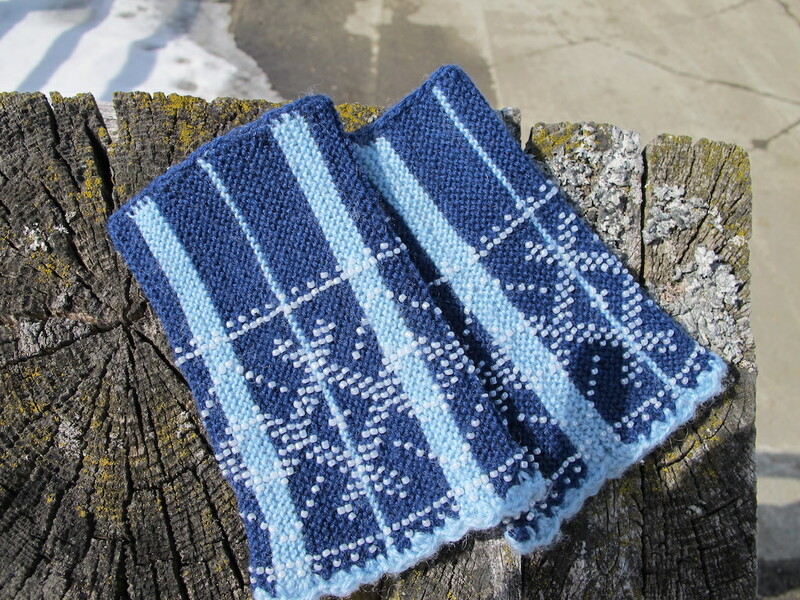 If you enjoy the folk art and craft topics in Kathleen’s books and on her blog, you might also enjoy my latest book, Lithuanian Knitting: Continuing Traditions. In its pages, you can learn about the history, culture, and folk art of Lithuania. 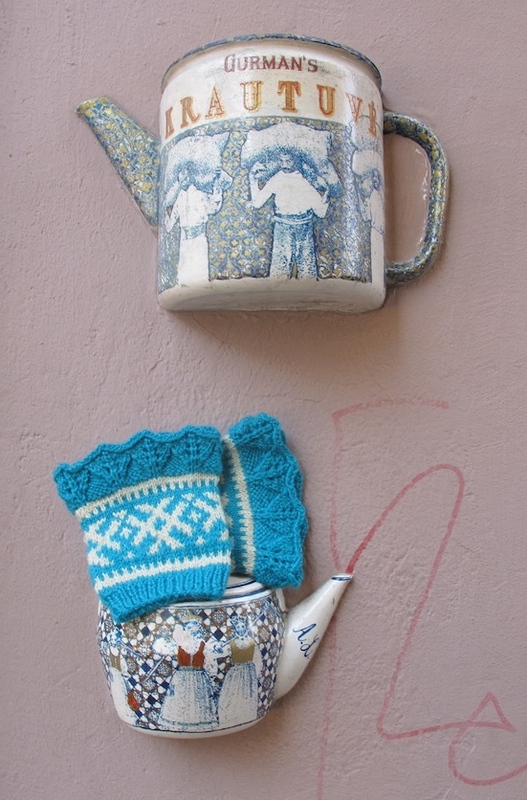 There are also over 25 mitten, glove, and sock projects to knit using traditional Lithuanian motifs and techniques. 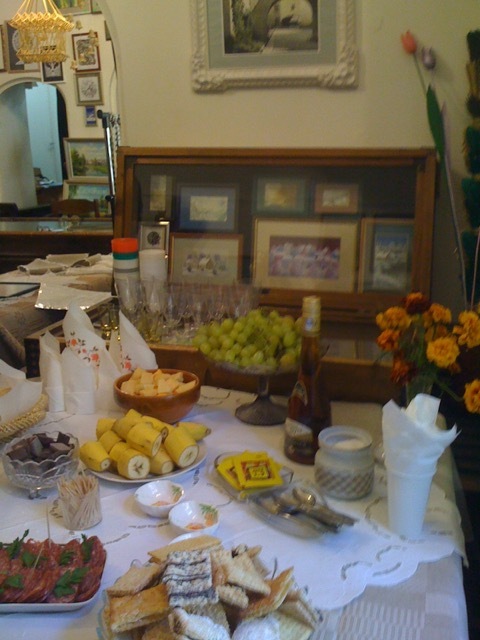 Kathleen also writes about foods a lot, so I can’t resist sharing this photo of the delicious Lithuanian pastries that were served at the shop when I accidentally visited during the launch of a new exhibit. Here’s my grandmother’s Krushtuki recipe, which is lacking enough details that you could not make these yummy cookies without first helping Grandma roll, cut, and shape the dough, and fry the cookies in her kitchen. Add sugar and eggs one at a time, then vanilla, salt, and flour. Knead until it doesn’t stick. This entry was posted on May 18, 2015 at 9:00 am and is filed under BOOKS BY OTHER AUTHORS, FOODWAYS, HANDWORK. You can follow any responses to this entry through the RSS 2.0 feed. You can leave a response, or trackback from your own site.